Whilst the big mountains, the Munros, attract most attention Scotland is full of fine smaller hills that have much to offer walkers and lovers of wild country. Many of these lower hills – Stac Pollaidh, Suilven, Ben Loyal - are more interesting and dramatic than many Munros. Often they make better viewpoints than bigger hills too. Little Sgurr na Stri in the Cuillin has arguably the finest hilltop view in the Highlands (see my post for October 7 2008 titled A Few Days on Skye). Lower hills are also excellent for short days when time is limited and for days when the weather makes going higher unattractive. One of my favourite smaller hills is Meall a’Bhuachaille (shepherd’s hill) which rises above Glenmore and Loch Morlich in the Northern Cairngorms. I often wander up this hill when I have a few hours spare after meetings or other business in Aviemore or at Glenmore Lodge and I regularly take visitors with little time up there for a taste of the Cairngorms. The walk through ancient pine forests past An Lochan Uaine (the green pool) in the steep-sided V-shaped Ryvoan Pass is lovely and I always admire the returning forest that can be seen spreading up the slopes either side. Beyond the trees the path, recently rebuilt and realigned, climbs the open western slopes of the hill to the stone shelter at the summit. A few days ago I climbed this way on an afternoon of racing clouds and roaring wind when there was no time to venture into the higher Cairngorms (and no desire to do so in such weather). I reached the summit shortly before sunset and huddled below the crude stone walls of the shelter for a quick snack out of the bitter wind. As I began the descent the forest below me darkened and Loch Morlich sparkled in the fading light. Beyond the sweep of the trees the snow-covered Sgoran Dubh Mor – Sgor Gaoith ridge shone palely as the sky above turned yellow, orange and red. I lay in the heather to steady the camera as I photographed this magical scene then descended into the blackness of the trees. 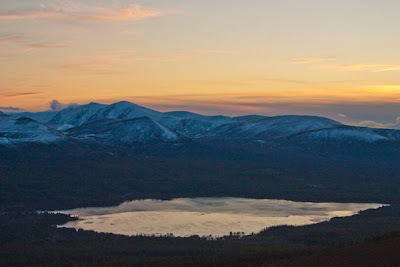 Photo info: Dusk over the Cairngorms and Loch Morlich from the southern slopes of Meall a’Bhuachaille. Canon EOS 450D, Canon EF-S 18-55mm IS@44mm, 1/200@F6.3, ISO 400, raw file converted to JPEG in Lightroom 2. I love that walk, Chris - which I did when camping in the Cairngorms a few years ago. I remember watching from the top the smoke from forest fires near Loch Morlich. I don't leave many comments so I thought I'd one just to say I enjoy visiting your blog/site, so thanks for taking the time to do it!